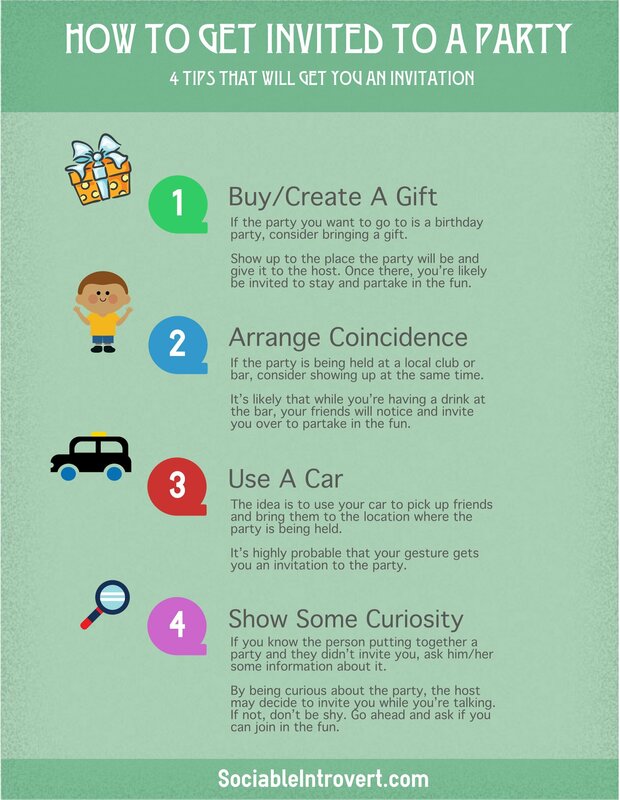 In this article you will find out how to get invited to a party (infographics and video included). Is it common for somebody to throw a party and you not be invited? When it comes to partying, shy people tend to get the short end of the stick. The rejection of not being invited can make you think the party host either didn’t want you there or just forgot to ask you to come. These negative thoughts can vary but the core idea behind them is the same: you’d like to join in on the fun and you’re not invited. Worst off, this negativity can spill over into more parties, meaning you miss out on party after party. If you and the host barely know each other – mere acquaintances – then the host may be hesitant in inviting you to a party he/she is throwing. Believe it or not, how you portray yourself may determine if you do or do not get invited to parties. If people see you as not the partying type, they’re not likely to invite you to a party they are throwing. For example: you may have a reputation for being the loner type – someone who doesn’t mind spending time by themselves every day. For that reason, people may not think that you’d be interested in attending a party. Keep in mind that doesn’t mean your character is incompatible with parties. It only means that people have seen just one side of you. If you’re going to change how people perceive you, you need to display that party-side personality… and you have to do it by getting into a party. How Do I Get Invited To A Party? Well, that’s the real question, isn’t it? Believe it or not, all you have to do is stop guessing and just ask the host if you can come. If you don’t know him/her, ask a friend to introduce the two of you. That’s all you have to do! You might think that’s the end of this article, right? Wrong! After all, being forward with your request can be downright intimidating, and if you could do it, you would have already. So, with that in mind, there are several other options that you need to use to ensure you get an invitation to the party – all without having to be straightforward. If the party you want to go to is a birthday party, consider bringing a gift. After all, it’s the most effective way to be invited to the party. Be sure you purchase a tiny symbolic present (or, if you have the skills, make one). Show up to the place the party will be and give it to the host. Once there, you’re likely be invited to stay and partake in the fun. Should things not work out the way you planned, you can always say you weren’t going to party tonight and just wanted to pay the host a visit and tell them Happy Birthday because you were in the neighborhood. Keep in mind that the technique only works if you do know the host… even if they’re just an acquaintance. If the party is being held at a local club or bar, consider showing up at the same time. This makes it look inconspicuous that you’re actually trying to be invited to the party. It’s likely that while you’re having a drink at the bar, your friends will notice and invite you over to partake in the fun. The technique can work even if you’re unfamiliar with the host but someone from the party knows you and will introduce the host and the other party members to you. In my previous articles, I mentioned the significance of using a car. However, I’m going over it once more. The idea is to use your car to pick up friends and bring them to the location where the party is being held. It’s highly probable that your gesture gets you an invitation to the party. – What kind of party event is it – birthday, anniversary, New Year’s, etc. – When will it take place? – Where will it be at? Consider starting the conversation by saying something along the lines of: “Hey, I heard you were throwing a party”. By being curious about the party, the host may decide to invite you while you’re talking. If not, don’t be shy. Go ahead and ask if you can join in the fun. Be aware… this will only work if you know the party host. There you go! These are just some of the methods you can use to get invited to a party. If you think they’ll work for you, you can acclimate them into your personality or use them as is. Now the video is available! There is this girl that is hosting a big end of the year party and she is inviting a lot of people. She’s also the most popular girl in the grade. I have talked to her before at volleyball, and we became friends. But volleyball ended, and we don’t talk much anymore, only a rare greeting in the hallway. My best friend somehow got invited even though she and the host have only said hi to each other. I was not invited, and I have no idea why my friend was invited but I wasn’t. I want to be curious about the party, but I’m afraid she will just ignore me since she is so popular, even though she is very nice. What do I do? have your own party and don’t invite HER!!! Wow, these are super creepy suggestions. Communicate verbally, don’t be creepy. “I’d love to join your party!” That’s all it usually takes. If that doesn’t get you invited, you aren’t wanted, and who wants to be where they are not wanted? Tom, you’re right. The straightforward way is the best one. Unfortunately, it’s near to improssible to use it for many of us.